Was it possible to make a phone call from Germany to the U.S. in 1946? For all practical purposes, this would not have been possible. Let’s start with the “phone call” part, because that is the easiest. The first successful transatlantic telephone cable was not laid until 1956, which is a decade later than 1946. Even in 1956, the process of setting up a transatlantic call might take several hours. You would call your local operator, who would transfer you to a “traffic operator.” That operator would in turn call the transatlantic operator and get in line for a circuit. You would hang up but wait by the phone. At the other end of the line, the person you wanted to talk to would do the same thing. At some point, maybe two to 24 hours later, a circuit would free up, and the traffic operator at both ends would call the two endpoints. You would answer the phone (because you had been standing by), the person at the other end would do the same, and the two operators would connect you. So, no, it is not realistic that there would have been any phone call made in 1946. By the way, the first cable had 36 phone circuits. That means that at any given time, a maximum of 36 simultaneous transatlantic calls could be made. Hence the wait for a free circuit. This continued for quite a while; I have a friend who moved to Canada from England in 1968, and she confirmed it was still working as described above until the early 1970s. Transatlantic voice radio calls were practical from about 1927 onward, and during World War II this was expanded to include encrypted calls. However, in 1946 this service would have been available for military use only, and unless this character was very high brass indeed, the likelihood of it happening is not realistic. Even in 1954, there were 12 transatlantic radio channels. Twelve! Maybe amateur (ham) radio? Very, very unlikely. First, ham radio was shut down during the war. And second, almost all ham radio at the time was Morse code, not voice. And third, chances of a working ham station in Germany in 1946 is slim indeed, since it was not allowed until 1950. A Teletype on display at the National Museum of Computing. So what is the most realistic method of high-speed communication? 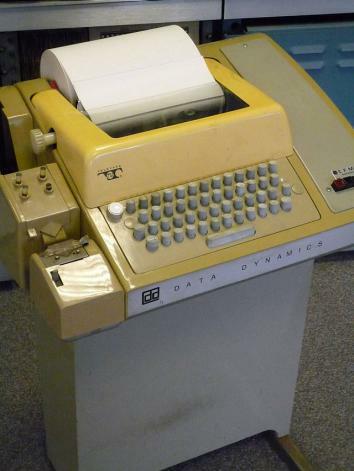 A Telex or Teletype. This was a semi-automated telegraphy system that used telephone or telegraph cables to transmit text. Think of it as a very crude form of text message: You went to your Telex machine, dialed the number of the remote machine, and as you typed the message your machine would print out on the remote machine. Both military and civilian organizations also used radioteletype machines for wireless long-distance communication. An interesting aside is that the German military was completely managed via radioteletype, and that is the very code that was broken by Alan Turing at Bletchley Park, Britain’s code-breaking center. 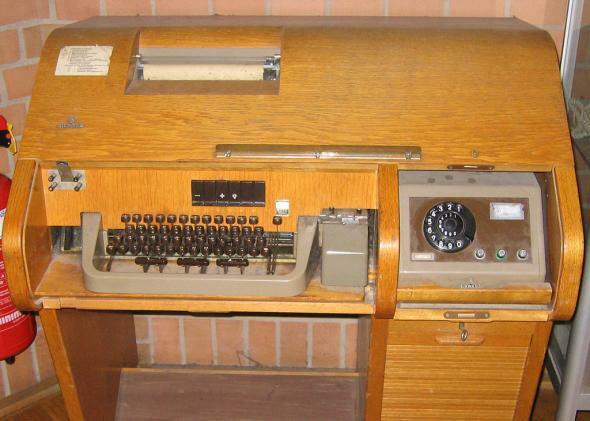 In 1946, the teletype service would have used dedicated equipment, provided by either the military or Western Union. Telex was the ubiquitous method of inexpensive long-distance communication well into the 1980s and was only replaced by fax in the 1990s. Until about 1980, telephone communication through the Canadian arctic was done via radio. Trust me when I tell you that the quality of these calls was very, very poor. If the “atmospherics” were bad, calls were impossible. We could go days at a time without being able to place or receive calls. Finally, just like with a CB radio or walkie-talkies, you could only talk in one direction at a time. Because the time it took a human to type the message was longer than the time to actually send it, messages were typed and encoded to paper tape and then sent in batches. And for the real geeks among you: Early computers had nothing like the fancy displays we have now—in fact they had no displays at all. Instead you used a terminal to send data to the computer and receive data back. Turns out that Teletype machines made inexpensive terminals, so that’s what you used. Here’s Denis Ritchie, the inventor of Unix, sitting down at the Teletype, in this case hooked up to a DEC PDP 11. You knew there was a good reason that the terminal driver was called /dev/tty, didn’t you? And that’s also why all Unix commands are so short: Because it was too much work to type in long ones on the Teletype! Telephones: How did people “call” the police before phones existed? Communication: What are the best examples of story in marketing? History: What was the single most critical mistake that led to Germany’s defeat during World War II?